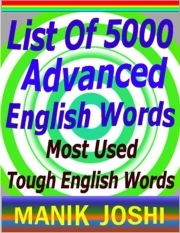 Description of "List of 5000 Advanced English Words (eBook)"
There are thousands of words in English language. To learn meanings of all these words is really difficult. If you have sound knowledge of Basic English, you are supposed to know meanings of hundreds of common words in English. Now, it is time to enhance your English vocabulary by learning most used advanced English words. I have selected 5000 advanced words based on their frequent use in newspapers, magazines, books, internet, etc. It took me more than 10 years to create list of 5000 most used advanced English words. IMPORTANT NOTE: I have not given meanings of these words in this book. You can use any dictionary of your choice to find meanings of these advanced words, or if you wish you can buy my book “DICTIONARY OF DIFFICULT WORDS: 5000 ENGLISH WORDS” in which I have given 5000 words and their meanings. Manik Joshi was born on Jan 26, 1979 at Ranikhet and is permanent resident of Haldwani, Kumaon zone of India. He is an Internet Marketer by profession. He is interested in domaining (business of buying and selling domain names), web designing (creating websites), and various online jobs (including 'self book publishing'). He is science graduate with ZBC (zoology, botany, and chemistry) subjects. He is also an MBA (with specialization in marketing). He has done three diploma courses in computer too. ManikJoshi.com is the personal website of the author. Reviews of "List of 5000 Advanced English Words (eBook)"